A new 100mm astronomical telescopes completed with a refracting objective lens and achromatic objective lens allow seeing all colors of Moon, Mars, Venus and other celestial objects as well as to make the various unique photographs. High quality of objective lens provides a bright contrast image. Telescopes are mounted on the equatorial mounting. Besides a model TAL-100RM has a clock drive. Both of models can be completed with a metal pier and supports or tripod under the customer's request. For easy observation of celestial objects near by zenith an eyepiece set of telescope turned to optical axis of tube by 90°. 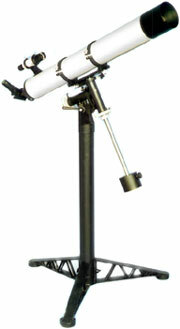 Telescopes are completed with 8x finderscope and two eyepiece f=10mm and f=25 mm. Also it has a multi-coated brighten optics.